Koh Tachai Pinnacle also known as Twin Peaks ( because there are in fact two pinnacles) this site is so good you could dive it twice as we often do. 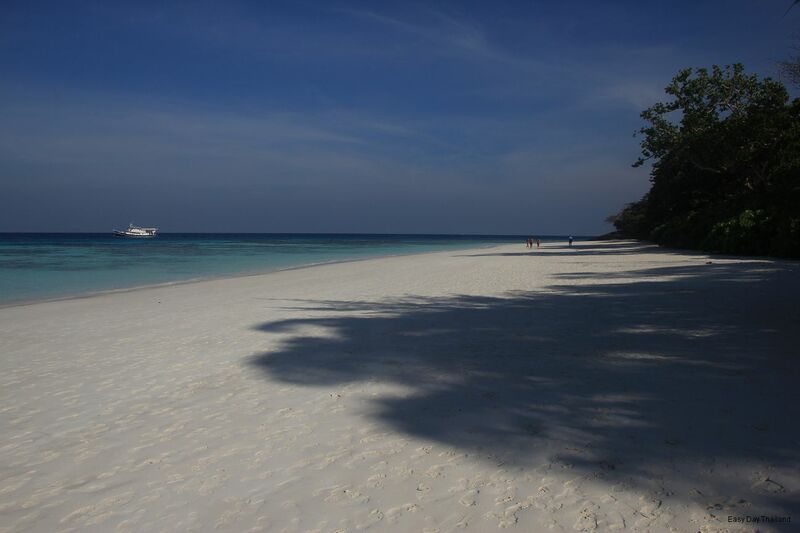 Its located south of Koh Tachai Island, which is part of the Similan Islands National Park. As said above this site is two pinnacle, the main focus of the dive is the first, shallower pinnacle starting at about 12 meters, meeting the sand at about 20 metres and continuing down to about 25 metres. This is basically one huge rock with some smaller rocks on it and then it is ringed by a mix of small and large boulders. The majority of the coral is around the north end of the pinnacle and in a number of bommies on the center of the main rock. This site is absolutely covered in macro life, nudibranchs, Ghost Pipe Fish, Coral Crabs. Snails and shrimp, but keep your eyes peeled Giant Barracuda and Trevally are regular visitors as well as the occasional Manta Ray and Whale Shark. The second pinnacle is much deeper with the top being at 18 meters, in the area you have probably you’re best chance of seeing Leopard Sharks, also octopus and turtles are often seen here. There are in fact three reefs on Koh Tachai, weather conditions permitting we will normally dive on the north eastern reef (starting from the north end of the beach to the Northern tip of the island), however if there are strong winds we will hide from them either on the south eastern reef (from the southern tip to the headland south of the beach) or the western reef (from the headland between the two small bays to the northern tip). However the conditions on the three dive sites are very similar. The reefs are made up of coral blocks and bommies scattered over gently sloping sand until you get close to the northern tip where there are enormous boulders similar to those which make up the pinnacle to the south, the maximum depth on these reefs is about 20 meters. If you are very lucky you will encounter Leopard Sharks or Black Tip Reef Sharks, certainly in the sandy patches there is a good chance of seeing blue spotted Kuhl’s Stingrays. The reef itself is populated by all types of reef fish, Damsels, Parrot Fish, Red Tooth Trigger Fish, Snappers and Wrasse just to name a few. In the shallow areas look in the sandy patches for Peacock Flounder and the juvenile Razor Wrasse. A note of caution this dive site is often subjected to strong currents, so listen to your dive guides instructions and stay calm, there are plenty of places to hide from the current during the dive.